Are These 7 Items Pointing To A Coming Economic Armageddon? I’m an optimist by nature but — hopefully you see that through the rest of my articles here — but I’m also practical. And there’s a weird amount of $hit going on in the U.S. and abroad these days that’s got me preparing for a possible economic meltdown. I’m one of those weird guys who likes to pour through documents like the 182-page LinkedIn S-1 Registration Statement (while flying to Salt Lake City for a trip with high-school buddies!). * 2009 to 2010 reflects just 9 month periods. Hiring Solutions: 44% — Recruiters (3,900 of them in 2010) pay LinkedIn to access and market to its database of users. This includes 69% of the Fortune 100. Advertising: 31% — Marketers (33,000 in 2010) run ads on LinkedIn’s page views. Subscriptions: 25% — LinkedIn members can use much of LinkedIn for free but there are additional things that users must pay for (such as seeing more than 100 results at a time or being able to filter your searches by seniority of a LinkedIn member). Due in part to LinkedIn’s money spent on a sales team in the field, their profit margins are lower than Google’s and Facebook’s. Did anyone notice that I just quoted myself? I’m just trying to break up the text components here! 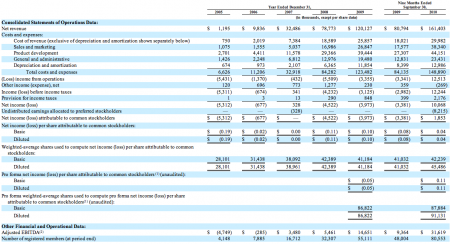 27% of net revenues come from outside the U.S.
LinkedIn is currently being valued at around $2.9 billion according to the latest shares being sold on SharesPost (note: this is not in the S-1 Registration). 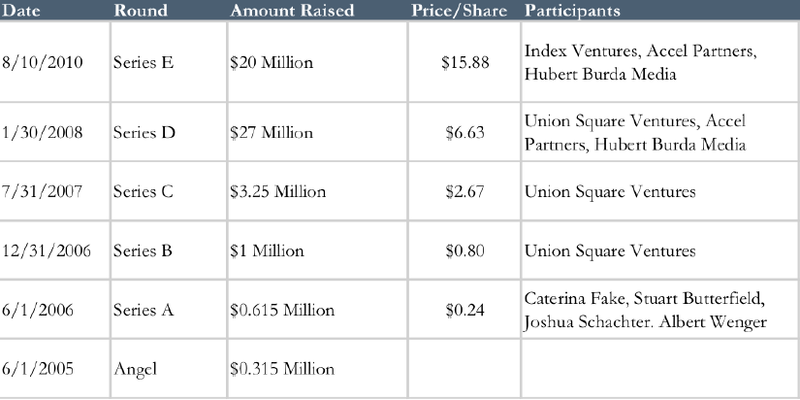 A LinkedIn IPO could value the company at a great price than the $2.9 billion based on those recent privately-traded LinkedIn shares. 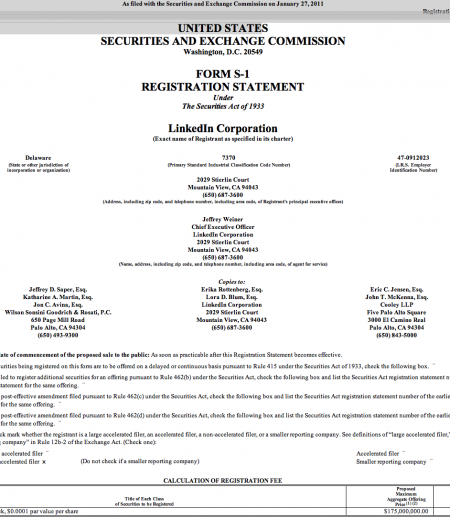 Of course, the LinkedIn valuation could change big time if we have an Internet bubble burst before they go public. Etsy: The “eBay of Handmade Goods” Worth $258 Million? I was on an interesting conference call by Arcstone Equity Research & SharesPost in which they walked through the Web business Etsy. New York-based Etsy is clearly a company on the move. 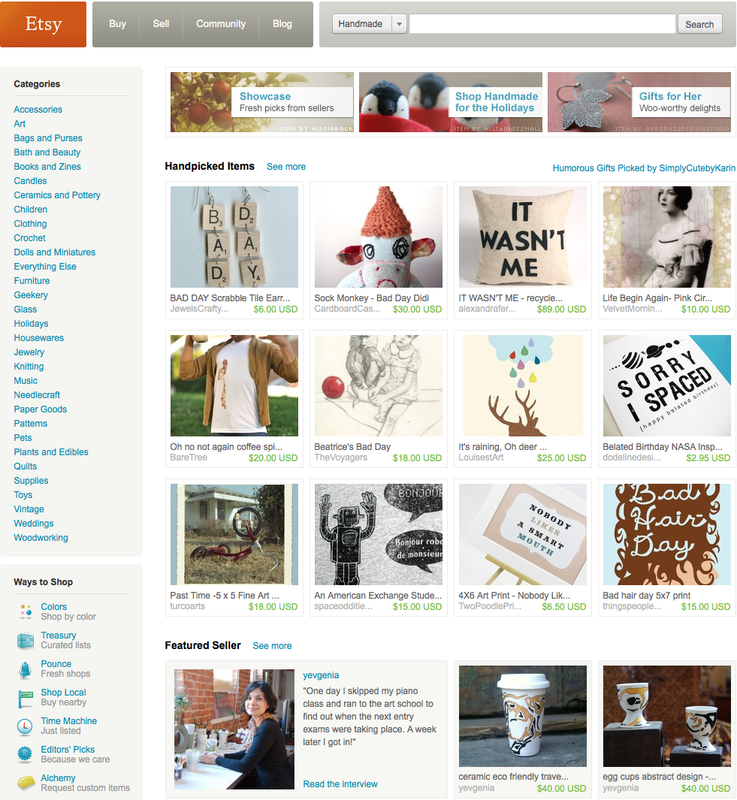 The gist of Etsy’s business is that they’re a marketplace of hand-made goods (sort of eBay but primarily hand-made)…here’s a screen shot showing you some of the types of things they sell. Fascinating Internet business on the move…a real niche dominator. 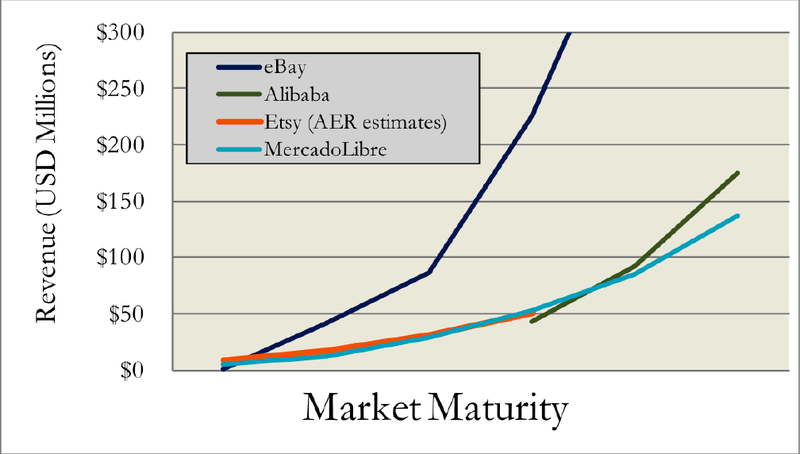 My best guess as to what will happen with Etsy: They will go public or be acquired by Amazon (Amazon loves to take out companies when they’re in the $100 million to $500 million per year revenue and if they own a niche). 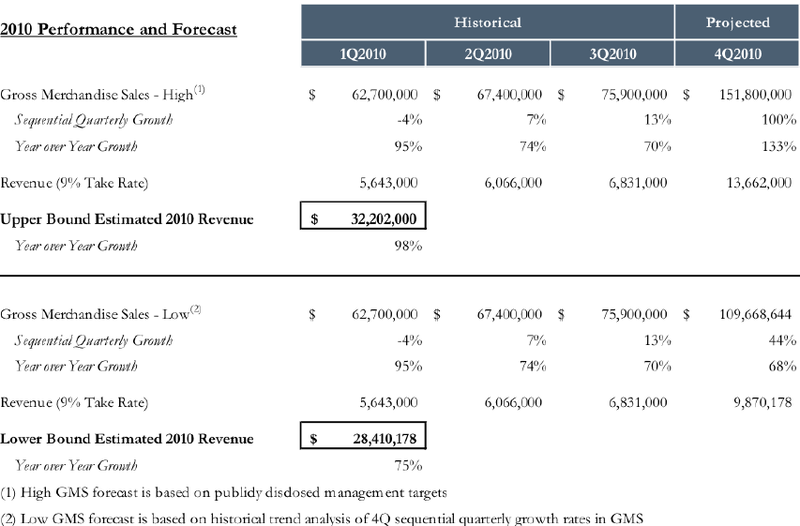 Why Did Ballmer & Others Dump A Record $4.5 Billion In Stock Last Week? Ballmer was part of a slew of insider stock sales last week, which saw a 2-year high in stock prices. The volume of insiders selling their stock versus those buying their stock is a good leading indicator of where the stock market might head. Afterall, if insiders (defined as stock sales by directors, executives or employees of a public company) are selling their own stock, it may be because they believe the stock price has hit a peak (alternatively, they may just need some quick cash). 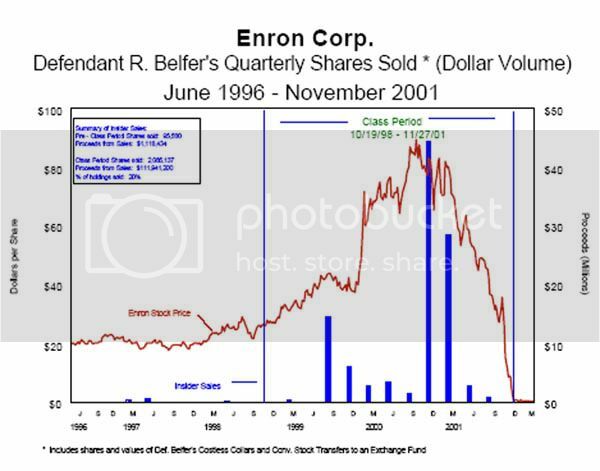 In more extreme examples, insiders may sell their stock because the company is in real trouble; some speculate that’s what was happening in the below chart (from a decade ago) showing an Enron insider selling a bunch of stock (the blue columns) when the stock price was peaking (the red line). The news this week doesn’t necessarily involve fraudulent activity but clearly some insiders see the market peaking. Ballmer was among executives at 125 companies in the S&P 500 who sold a total of $4.5 billion in stock between Nov. 3rd and 9th… at a ratio of 12 insider sellers for ever 1 insider buyer. That’s the highest ratio of sellers to buyers on record (InsiderScore has only been tracking the data since January 2004). The best other explanation for high insider sales is that some insiders may be worried that their capital-gains tax rate for assets owned at least a year will increase from 15 percent 20 percent in January (unless President Barack Obama and Congress extend the 15% rate.). My take is that the reason for the record insider sales is a combination of insiders thinking that the market may be peaking AND some folks worried that cap gains taxes are going up. There have been numerous financial crises in our world’s history but the financial meltdown of 2007-2008 will certainly be remembered in the history books. 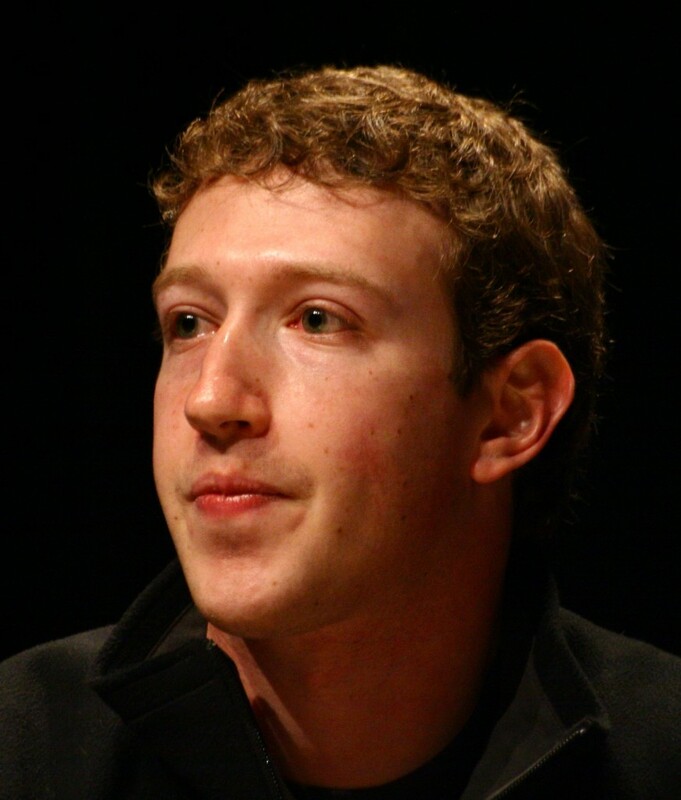 A clever man named Jason Witt has compiled a list of the 52 key players in the financial crisis. Why 52, you might ask? Well, to put them on the faces of a deck of cards of course. Witt, from my neighboring town San Ramon, California, is emulating the success of other Most Wanted Playing Cards such as the Iraq Most Wanted. I spoke to Jason and he’s a good guy — If you’d like to buy a deck, you can do so here: Financial Crisis Cards. While this isn’t meant to be a financial crisis blog, I am into business, the media and Wall Street…so I couldn’t wait to order a pack of these for myself and one other for my good buddy Larry the Wall Street Recruiter (Jason says that most people are like me: They’re buying 2 to 3 packs each). And for those who can’t wait to see who “made the deck,” below is a list of the players that Jason was kind enough to email me. He told me he felt bad about putting Obama in the deck but that he believes that half the country thinks Obama is to blame for the financial crisis. Without further adou, here are the men Witt thinks made financial crisis history. 7: Herb Sandler, ex-CEO, Golden West Financial Corp.
5: John Paulson, President, Paulson & Co.
8: Jamie Dimon, CEO, JPMorgan Chase & Co.
3: Robert Toll, CEO, Toll Brothers Inc. If you like Financial Crisis Cards, you may also be interesting in buying the Iraqi Most Wanted Playing Cards and America’s Most Wanted Playing Cards. Disclaimer: I do earn commissions off of products mentioned in this blog.